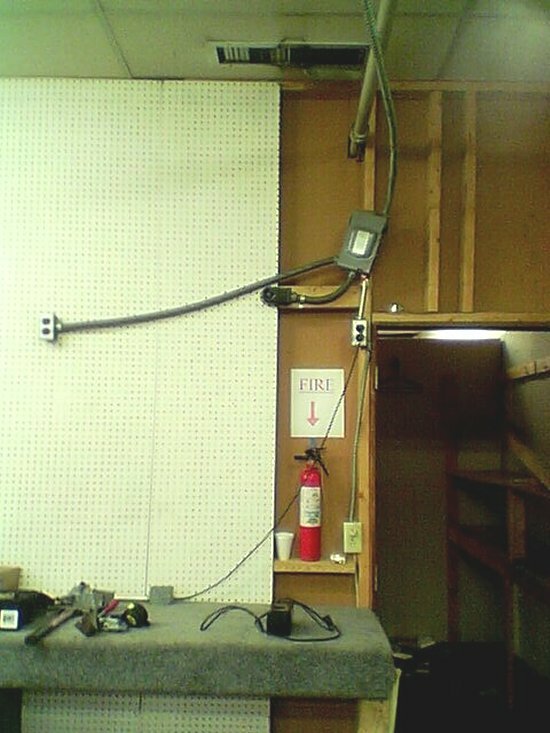 The Fire Extinguisher is quite fitting, given the circumstances. Yeah, but it is right under the source of ignition, lol. the reason the extinguiser is under the source of ignition is because its an automatic extinguiser. when the molten steel from the burning disconnect drips on the extinguisher, it will melt a hole in it. the extinguiser will automatically discharge, putting out the fire. Given the extreme slipshoddiness of the installation- and overfusing ("overbreakering? ")it to boot- I have to wonder what sort of powdered chemical lurks in that extinguisher... "Why, sure, I can use ANY ol' thing in this here fire extinguisher- I done charged it with this powdered stuff I found out yonder in the barn- it said 'Magnesium Powder' on it..."
I must admit that this is the best photo I've ever seen of tap rule violations.